Axonify is a rapidly growing B2B software-as-a-service (SaaS) company on a mission to improve workforce development. Since being founded in 2011, the Waterloo, Ontario-based business has experienced consistent growth and improvements to their platform. Now as one of Canada’s leading tech firms, Axonify brings it’s microlearning platform to companies all over the world who use it to improve employee skillsets and boost profits. For much of the company’s history, using government funding programs has been a key strategy. Axonify has used multiple government funding programs, including the company’s latest successful participation in the Ontario Scale-Up Vouchers Program (OSUVP), to reduce project costs and grow faster. Although their government funding needs have changed since being a small business, grants and incentives still play an important role in their growth. In 2018, the Scale-Up Vouchers Program awarded $1 million in business expansion funding to Axonify. This will help the company expand global revenues by over 100% by 2020. Axonify leverages some government funding programs through independent application, while others they entrust to the support of Mentor Works’ Government Funding Planners. Depending on the size and complexity of applications, it occasionally makes most sense to bring in specialists who have a better understanding of the program. This was the case for Axonify’s Ontario Scale-Up Vouchers Program win, where Mentor Works and Axonify worked collaboratively to develop a successful funding proposal. Axonify is a microlearning platform that ingrains employee knowledge and behaviours to help organizations better achieve their goals. The service uses science-based adaptive microlearning with gamification elements and impact measurement (reporting) to not only improve employee skills but retain that learned information for sustained results. Growth Coaches: Through the program, Axonify met with multiple growth coaches that specialized in scaling tech firms into world-leading companies. Through meeting with the coaches, Axonify developed a talent strategy that will enable Axonify to grow its operations here in Canada while supporting more clients across the world. Ontario Government Grants: Up to $1 million in business expansion funding can be provided to program applicants, and Axonify successfully received $1 million in funding to address its newly formed talent strategy. This includes support for onboarding up to 145 new personnel, conducting market development, and expanding the company’s platform. Upon project completion (expected in 2020), Axonify expects overall revenue growth of over 100%, including an international sales boost of 300% from its 2017 performance. An additional 145 new personnel will be needed by project end to support the business’ customer service, engineering, marketing, management and sales roles; this will have significant benefits to Ontario’s economy and help Axonify become a global SaaS leader. The Ontario Scale-Up Vouchers Program is a competitive application-based program that supports small and medium-sized businesses (SMEs) with high growth potential. New and emerging technology firms are the key target for the program, as these firms often face challenges accessing the expertise and financial assistance needed to grow at an accelerated, yet sustainable pace. Through the program, participating firms can access guidance from Growth Coaches while also leveraging up to $1 million in Ontario government funding. Growth Coaches assist Ontario Scale-Up Vouchers Program participants with expertise in several areas, including talent strategy, growth strategy, capital strategy, IP strategy, and international expansion. To qualify for OSUVP support, applicants must be an Ontario-based company operating in a priority industry, including information and communications technology (ICT), advanced manufacturing, cleantech, or life sciences. Applicants must also be incorporated for two or more years, maintain a minimum 20 employees at the time of application, and have annual sales/employment growth of at least 20%. Other eligibility criteria based on revenue and private capital raised also apply. Axonify’s participation in the Ontario Scale-Up Vouchers Program is not the first time it has received government funding support. For years, Axonify has explored government funding opportunities to develop export markets and improve its workforce. However, as the company grew, it’s funding focus shifted. Instead of pursuing multiple smaller grants and loans, Axonify now looks to larger, million-dollar programs that can provide a significant boost to the company’s growth potential. As Axonify scaled and shifted its funding focus to larger (and harder to access) funding programs, it has increased the importance of working with a government funding support services company like Mentor Works. Partnering with Mentor Works to develop a competitive funding application has substantially reduced Axonify’s time commitment and enabled the company to propose its growth plans in a way that speaks to the program’s requirements. Over the next couple years, Axonify will use the Ontario Scale-Up Vouchers Program guidance and funding to expand its domestic and international customer base. The enormous expansion brings incredible benefits to the company, Waterloo Region, and Ontario’s economy, marking a success for all involved. Axonify will continue to pursue government funding opportunities moving forward, including training grants to improve the skillsets of their new employees. Ready to access government funding? 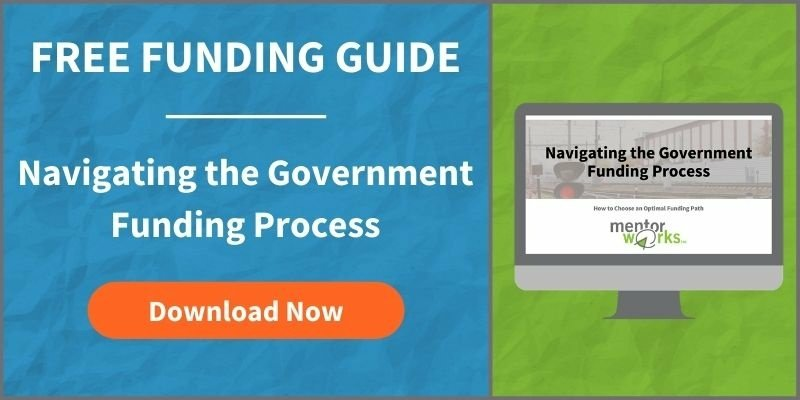 Discover multiple ways to approach funding applications through Mentor Works’ Navigating the Government Funding Process slide deck.